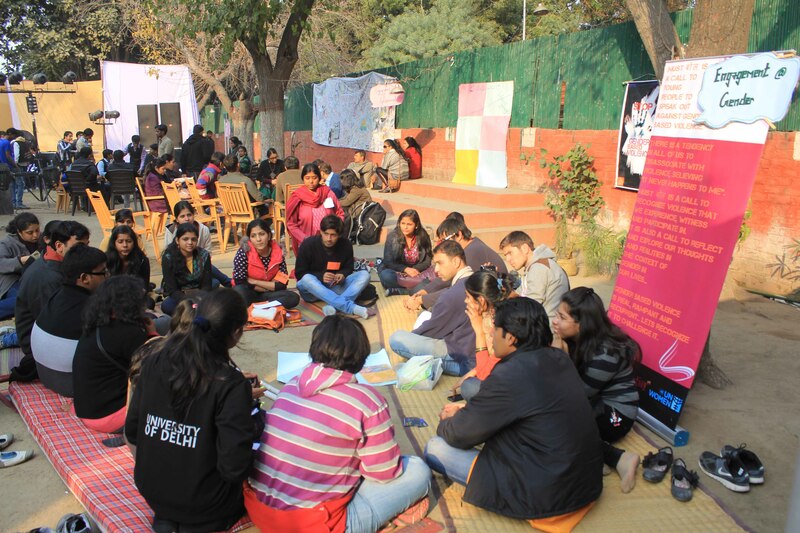 On a winter morning in a Delhi, 250 young people (in age and heart!) stepped out of the warmth of their homes on what could have been a lazy Sunday morning, to take action! All this energy congregated at the Foreign Correspondents’ Club near Pragati Maidan for 5th Space [Live]: Youth in Social Action–Making Sense of the Recent Upsurge. CYC, Pravah and Youth Alliance organized this event to create a platform for young people and youth facilitators to voice their opinions on spaces youth need to optimize their potential. The youth are always talked about being the ‘agents of change’, but instead are only treated as instruments in the process. The recent upsurge in Delhi that brought together young people across the country, screaming and demanding justice, did not go unnoticed by society and policy makers and is evidence that the youth want to be heard but are rarely given the chance. The 5th Space not only impacts the person who experiences it, but everyone around as well. It is called the 5th Space as it is a space that needs to be created beyond the four traditional spaces of family, friends, leisure and education/livelihood but it essentially nourishes these four spaces. “The beauty of the fifth space is that while it is created FROM the four other spaces, it gives more to those spaces than it takes. After the Smile internship which was essentially a month of uninterrupted existence within the 5th space, I feel fully equipped to deal with the other four spaces in a way that I didn’t even deem possible. 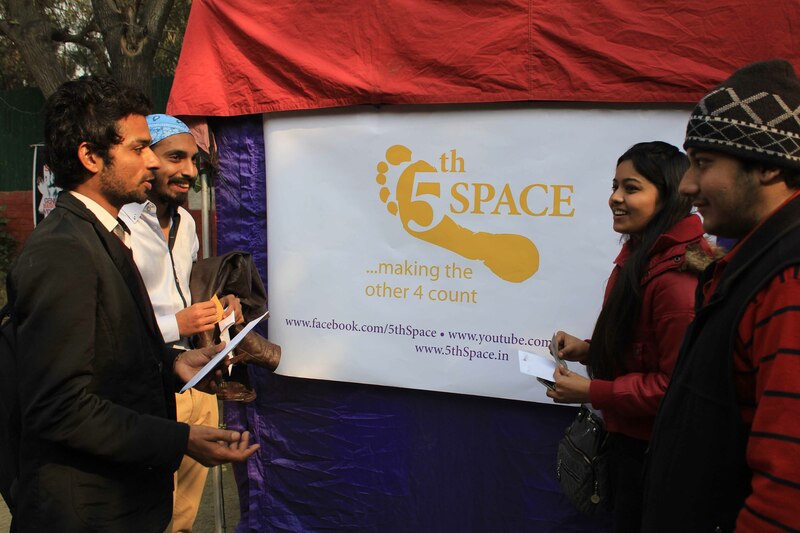 The day-long event commenced with a discussion on 5th Spaces that need to be created in society. Young people debated about ‘Violence is justified for the right cause’ and talked about what violence meant to them, what a right cause meant to them, and the values behind their stances of their agreement/disagreement. It was a full house event where people came together from various walks of life – volunteers, students, organizations working with youth, independent youth facilitators and media. The 5th Space wasn’t just a theory to be talked about during the day, but the principles of the 5th Space were lived by everyone that day – taking charge of the space, forming friendships beyond prejudices, understanding themselves through the actions they take in society, and of course having FUN! Taking forward the experience Ashraf Patel, Manak Matiyani and Prakhar Bhartiya, talked about what it took to create a 5th Space. Heading organizations that have imbibed the 5th Space values in not just their organizational structure but also live their own lives, they talked about the impact of such spaces on young people and indirectly on the lives of everyone who connected to everyone who had experienced such spaces. The day ended with a fantastic dance performance by a dance troupe interpreting the 5th Space experience obtained through a workshop facilitated and choreographed by Durba Ghose and Ekam Satyam’s live performance from the 5th Space album. Be with us for the next event in Delhi on the 23rd of February! Follow us on Facebook to keep yourself updated about the happenings on the 5th Space. Check out our YouTube channel for films on 5th Space experiences.